Denim with Colored Motes is one of our new favorite things! From Robert Kaufman, it’s sturdy and durable, just like a great pair of jeans but with a beautiful surprise: little flecks (AKA “motes”) of red, yellow, blue, and green! Use ½ yard with the light side as the right side of the fabric. 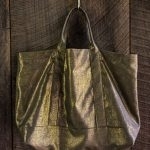 This is the Bag Fabric. Use the remaining ½ yard with the dark side as the right side of the fabric. This is the Accent Fabric. A 110-yard spool of Gutermann’s Cotton Sewing Thread in color 9280. 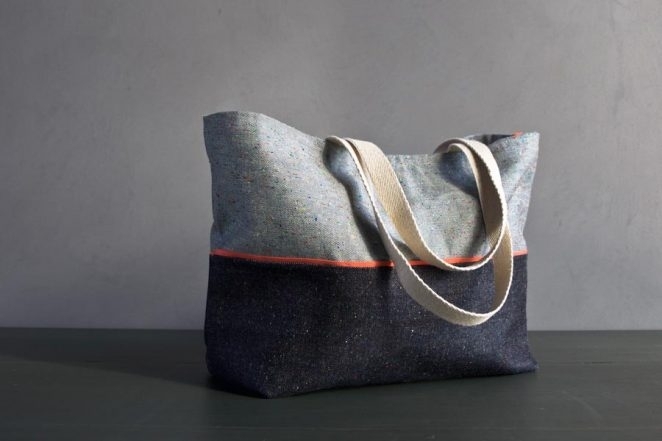 This is the Bag Thread. A 110-yard spool of Gutermann’s Cotton Sewing Thread in color 4970. This is the Bias Tape Thread. A jeans-weight sewing machine needle. We used Schmetz’s Universal Machine Needles, Jeans 16/100. 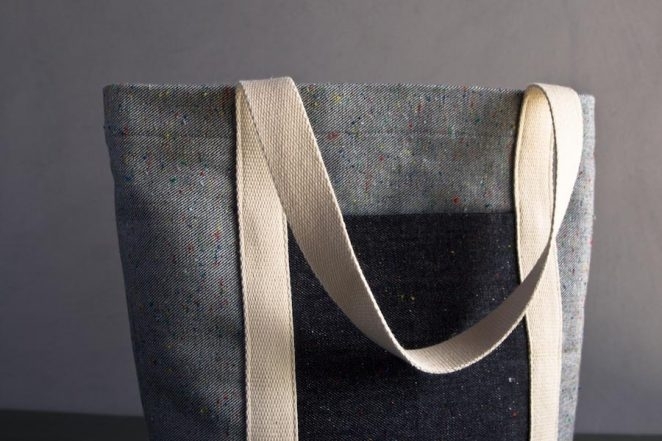 For the full free pattern visit our original Everyday Tote Pattern here! A 110-yard spool of Gutermann’s Cotton Sewing Thread in color 9280. This is the Fabric Thread when the lighter side of the fabric is the right side. A 110-yard spool of Gutermann’s Cotton Sewing Thread in color 6210. This is the Fabric Thread when the darker side of the fabric is the right side. A 110-yard spool of Gutermann’s Cotton Sewing Thread in color 1040. This is the Webbing Thread. 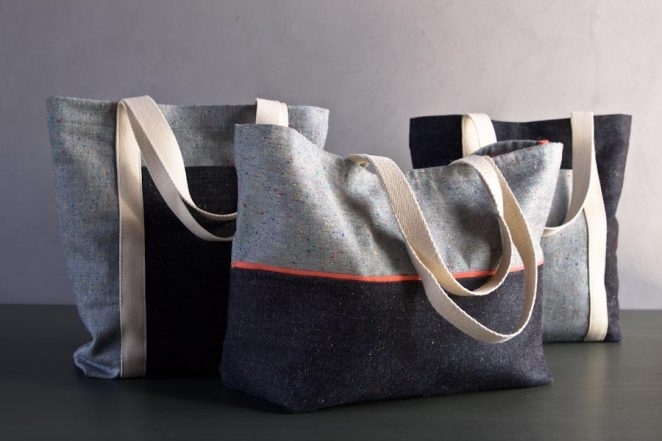 For the full free pattern visit our original Railroad Tote Pattern here! 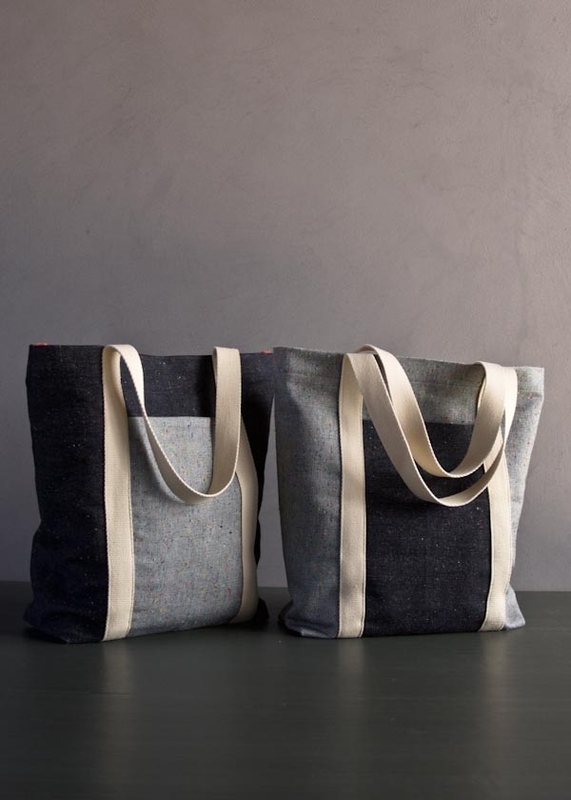 The Purl Soho Gift List 2015! 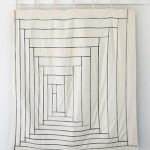 Is this wonderful fabric really already out of stock? We are so glad that you are just as excited as we are about this fantastic fabric! The Denim with Colored Motes is not out of stock! 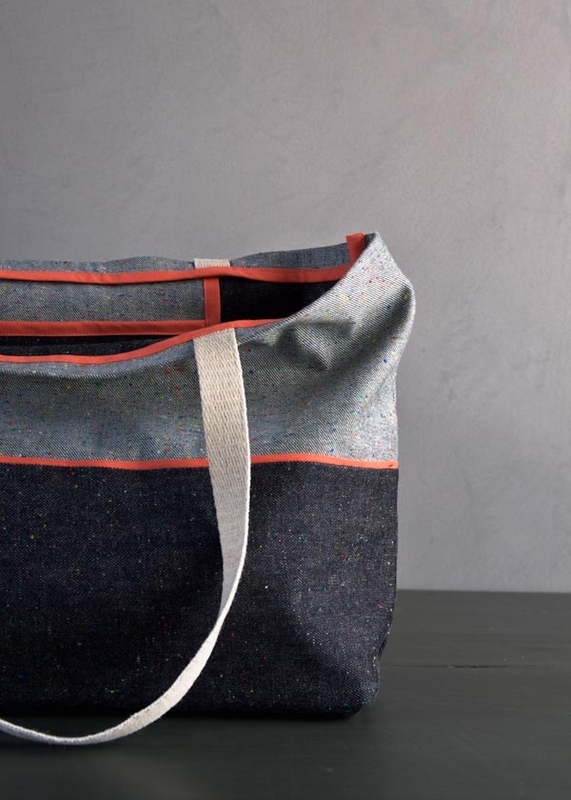 There is an issue with the link, you can find the fabric here: https://www.purlsoho.com/robert-kaufman-denim-with-colored-motes-denim-srk-15963-67.html. Thank you so much for writing in! Happy sewing! 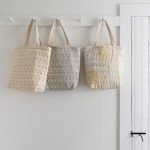 Great totes, I’ve just recently discovered you guys and I’d like to say how much I’m enjoying your posts and what a wonderful website you have. Thank you so much! We are delighted that you enjoy our website. Thank you. 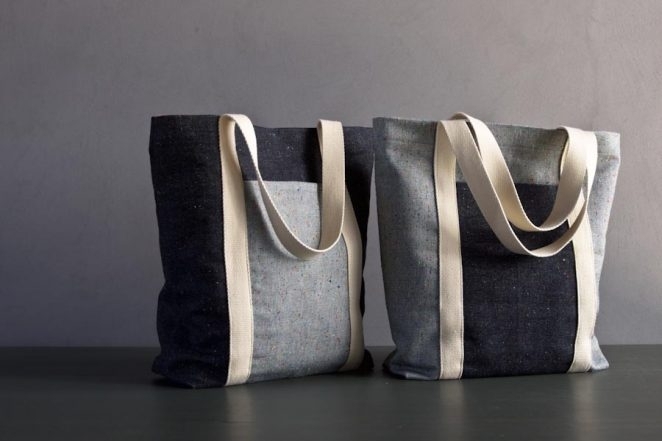 I have been following the directions very closely while making my denim tote, and I love that seams are covered, so they don’t ravel. One seam does not get covered, tho; the seam joining the upper contrast with the lower denim. Shouldn’t that seam be included in being covered? I don’t know that I’ll have enough seam binding if I cover it now? Would love someone’s thoughts on this! Thank you! I’m so sorry it’s taken me so long to get back to you! I’m not sure which seam you’re talking about? The top of the pocket? If so, that seam is hemmed on its own so it doesn’t need to be covered. Or, are you talking about the bottom of the pocket? If so that seam gets covered in the “Sew the Bag Together” section. I hope this helps. If I’m not getting your question please let me know! Thanks for getting in touch! 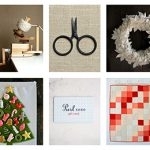 I love your site and you have the best color ideas for knitting and fabric. I realize this is a free pattern, but it strikes me that two posters’ questions weren’t accurately addressed. I am 3/4 of the way finished with this project and I can see that the poster (Nancy T) is referring to the cut bias tape that is between the bag panel and the accent panel. Is the excess bias tape just trimmed or should it be folded over and sen onto itself? Also, another poster (Michele C) questioned the final measurements of 21 1/4 inches wide X 12 1/4 inches tall X 6 inches deep -how does a 10″ plus a 17″ deep panel (27″ total without seams) become 18 1/4″ (height plus depth)? 1) how many inches from the raw edge of the bag panel is the cut bias tape sewn (after it is pressed on the accent panel. The way it is currently written, my pocket didn’t turn out to be longer than the bias tape line. 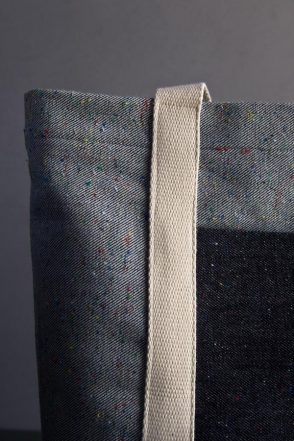 2) the height of the finished bag panel and the accent panel from the bias trim to the cut corner. Also, your bias tape appears much narrower in the picture than the 3/4 in tape suggested. I’m thinking you just need to change the size of the cut panels. Thanks for your help! Thanks for getting in touch. Answers below! Question from Nancy T about the Bias tape… The cut edge of this bias tape is under the seam and thus hidden you don’t need to to anything additional to it. Question from Michele- You are sewing the accent panel to the Bag Panel by lining up their bottom edged (this is described in the “sew the bag panels” section.) So, for the finished measurements we only have to take the Bag Panel into account. 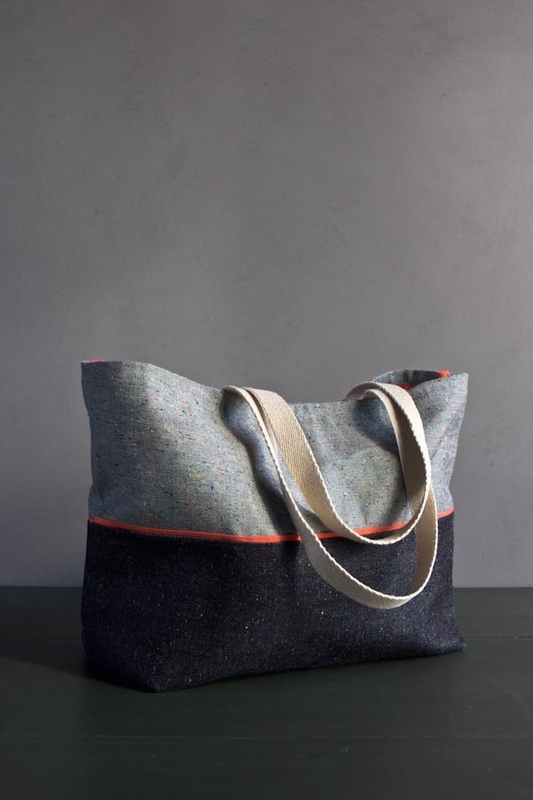 With the top hem and bottom seam allowance the bag ends up being 12 1/4 -inches tall and 6 inches deep. If you don’t take the depth into consideration it will measure 15 1/4 tall. The depth of 6-inches comes from 3-inches on either side of the bottom seam. 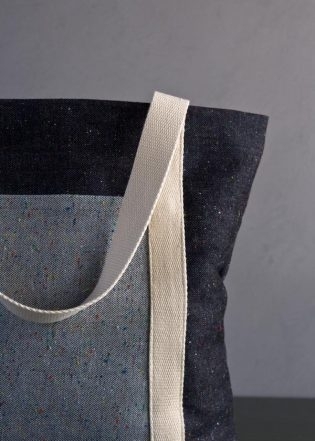 1) I am not sure I understand what you’re asking here… The accent panel is sewn to the Bag Panel so that they basically become one large piece, as described in the second to last paragraph of the “sew the bag panels” section. The accent panel does not form a pocket. I hope this answers your questions! Please let me know if you have any more! Thanks you for answering my questions. I wanted to let you know that my bag came out fabulously once I realized that the bag is two thicknesses on the bottom. I was trying to seam the dark and light pieces together and kept wondering why the instructions referred to the bag and the panel instead of the top and bottom. This was definitely a case of interpreting the picture and not paying attention to the written instructions. I saw an interior image of this project on someone’s blog and that’s when I realized what I had been doing wrong. I used denim as my fabric and had originally switched the panels thinking the dark piece had to be the bigger one. I ripped it all apart and switched the fabric and once I had the pieces and understood the instructions it only took a couple of hours to sew. My daughter loves the bag and now I need to sew one for myself…or something else because this was definitely a fun and rewarding project. Thanks again. Hi, you have some amazingly tempting projects but I live in the UK. 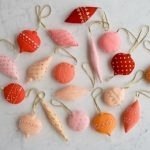 Do you have anyone who supplies over here, as I guess the shipping costs will be prohibitive ? Are you out of stock or not carrying the denim with colored motes. I have tried both links and it says it isn’t available. Thank you for your question. We have the denim with colored motes fabric in stock and available here. If it is still not working for you let me know what kind of alert you are getting from our website and I can look into it for you. Let us know if you have any other questions, we are happy to help. 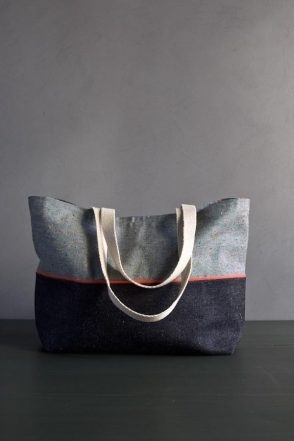 I made the Everyday Tote in the Denim Motes color this week. I think there may be a mistake in the yardage requirements? My finished tote is huge! Are you sure the bottom pieces measure 17″ x 22″? How do you end up with a finished size of 20″ x 12″? I’m sorry to hear that the bag ended larger than you anticipated! You are correct that the finished measurements aren’t 100% accurate. The finished measurements are actually 21 1/4″ wide X 12 1/4″ tall X 6″ deep. I have updated the finished measurements on the original pattern. But these corrected measurements are fairly similar to the original so I don’t think that addresses the big discrepancy you are seeing. I am wondering if maybe you are measuring the bag without taking the depth into consideration? In that case the bag would measure 21 1/4″ wide X 15 1/4″ tall. This is the correct size of the bag, just a different way of measuring it. I hope this answers your questions! If not, please let me know!! On the Mothers’ Day cover page there was a section of scarves; I clicked on it to learn what the fabrics were and it just disappeared, never to return. Can you provide more information? I knit scarves but would love to know more about these. Thank you. Thank you for your interest! Is this the link you were looking for? 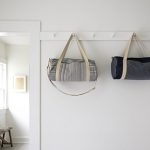 We used, shown from top to bottom, Robert Kaufman’s Manchester in Steel, Mist, Taupe, and Ivory; Kiyohara’s Large Gingham in Grey; and Kiyohara’s Small Gingham in Grey for this project. Hope this helps! 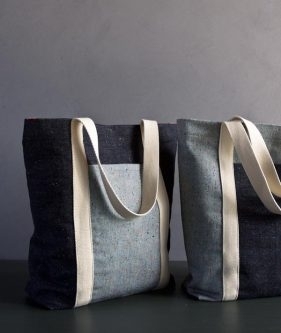 Would the heavyweight mineral linen collection work with this tote pattern or is it still too thin? Thank you for writing in! 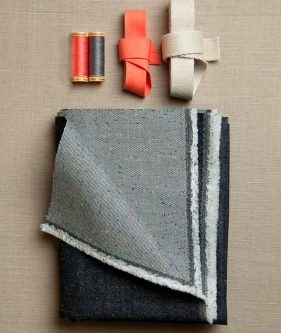 You can use the heavyweight Mineral Linen, but it won’t be as structured and stiff as the Denim we used. Just double checking that you recommend pre-washing the denim with motes fabric as it instructs in the original pattern with the canvas? Yes! We definitely recommend pre-washing this. Do it with darks because dark denim like this has a tendency to bleed. What color of the cotton thread do you recommend for the jade green bias tape? Thanks for writing in! I would pair the Jade Green bias tape with Gutermann 7745 or 7760 for a slightly darker color. I’m just wondering if this denim with colored motes would be too heavy/stiff to make a pencil skirt out of? If so, do you have another denim you would recommend? Thanks! Thanks for writing in! It would depend on the pattern you are using and what effect you are going for – although the Denim with Colored Motes is very heavy and stiff, it does soften up over time. 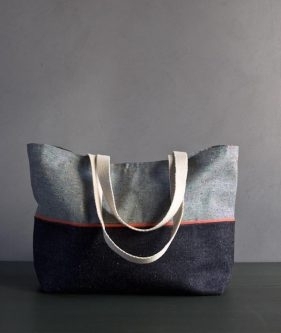 I made a large knitting tote out of this denim about a year ago and it sees almost daily use, and it has become quite a bit softer and I could see it as a structured pencil skirt! If you are looking for something a little lighter weight, I think Draper Denim would be an excellent bottom weight for garments!